Recently I located a portion of the Old Wawona Road that was the original alignment used by wagons and early cars to get to Yosemite Valley from the south before the Wawona Tunnel was built. Locating the Old Wawona Road was the primary driving force to head to a very dry Yosemite National Park this winter. Generally I don't talk about the history of a route first, but in the case of the Wawona Road I thought it was particularly important to do so first. The modern Wawona Road is approximately 28 miles in length from the north terminus of California State Route 41 at the boundary of Yosemite National Park to South Side Drive near Bridalveil Falls in Yosemite Valley. A good chunk of people entering Yosemite Valley use the Wawona Road which generally is considered to be the easiest route...that certainly was not always the case. The origins of the Wawona Road are tied to the Wawona Hotel but it does partially do pre-date it. In 1857 Galen Clark constructed a bridge crossing the South Fork Merced River which was known as Clark's Station. Clark intended to build a road to Yosemite Valley but ultimately failed to do so. In 1875 Clark's Station and the rest of his property was purchased by the Washburn Brothers who subsequently covered the bridge which soon came to be known as the Wawona Covered Bridge. The Wawona Covered Bridge was part of the Wawona Road until a replacement span over the South Fork Merced River was built about 700 feet to the west. The first structure in the Wawona Hotel complex built by the Washburn Brothers complex dates back to 1876. At the time the Wawona Hotel was built to take advantage of tourism to the nearby Mariposa Grove. The name Wawona apparently comes from a similar Mono Tribal word describing a Redwood Sequoia Tree. The Washburn Brothers completed the Wawona Road from their new Hotel to Yosemite Valley by 1879. Despite only being less than 30 miles south of Yosemite Valley the Wawona Hotel was essentially a several day trip by foot through the wilderness. The Wawona Hotel was becoming popular and interest in a stage road north to Yosemite Valley was becoming a viable concept. Thus, the Yosemite Stage and Turnpike Company was founded in 1882 to facilitate stage route travel from the Wawona Hotel to Yosemite Valley. I found these two articles incredibly useful in terms of tracking down the early history of the Wawona Road. This 1883 Topo Map shows the early Wawona Road which apparently was once called "Madera or Merced Big Trees & Yosemite Road." This 1885 map from the Yosemite Stage and Turnpike Company shows the entirety of the Yosemite Road to Wawona from Raymond and the full stage route north from the Wawona Hotel to Yosemite Valley. Interestingly it appears that the Yosemite Road north out of Raymond had two branches that split at Ahwahnee. The railroad that serviced Raymond was a Southern Pacific line out of Madera and was still present on the 1935 California Division of Highways Map of Madera County. Traveling to Yosemite via Wawona for a time must have been at minimum a week long commitment considering how much ground had to be covered on foot or a wagon. It is odd to think of travel to Yosemite being something someone had to commit to so fully considering it is within day-trip driving distance by car and modern highway. Apparently it wasn't until 1916 that serious attempts to get cars over the Wawona Road to Yosemite Valley were made. The 1923 USGS Map of Yosemite shows the Wawona Road as it in the early automobile era. On the above USGS Map there are several stage stations that are named. Fort Monroe was the most notable stage station which was named after a stage driver George Monroe. Apparently during the wagon era the stage stations were used as stopping points to camp, not much changed during the early automotive era. It is hard to fathom Pre-War cars trying to traverse high dirt grades that were meant for wagons. Apparently the Washburn family had a garage at the Wawona Hotel that serviced vehicles that broke down on the Wawona Road. The Washburn family sold the Wawona Hotel and the Wawona Road to the National Park Service in 1932. The sale no doubt was likely due to the construction of the Wawona Tunnel which started in January of 1931. The Wawona Tunnel is a 4,230 foot long tunnel which was bored through granite and provided a much more even grade for automobile traffic entering Yosemite Valley. The Wawona Tunnel opened in June of 1933 and has remained the longest in California. I found this document on NPS.gov detailing the construction history of the Wawona Tunnel. The difference in the Wawona Road after the completion of the Wawona Tunnel was substantial. The Old Wawona Road cut directly north over high ridges towards Inspiration Point at Grouse Creek. The new road that accessed the Wawona Tunnel took a more gradual descent along the ridges. Both the Old and New Wawona Roads can be seen on the 1938 USGS Map of Yosemite. The Old Wawona Road appears to have quickly fallen into disuse after the completion of the Wawona Tunnel. The 1948 CSAA map of Yosemite shows the Old Wawona Road as trail from Grouse Creek to Inspiration Point. My understanding is that the Pohono Trail once started at Inspiration Point when the Old Wawona Road crossed by it. The 1951 USGS Map shows the Pohono Trail extended to Yosemite Valley utilizing parts of the Old Wawona Road. So with all the above in mind I entered Yosemite via the north terminus of CA 41 which becomes the Wawona Road upon entering Yosemite National Park. After passing the entrance station for Yosemite National Park there was a new roundabout at what used to be a T-junction with Mariposa Grove Road. The new roundabout was constructed this past year and is part of the restoration project ongoing in the Mariposa Grove. The Mariposa Grove apparently will reopen in June this year. From the entrance station Wawona is four miles away. Wawona and the Wawona Hotel are located at about 4,000 feet above sea level on the South Fork Merced River. The Wawona Hotel hasn't changed much over the years and appears much as it always has. The hotel was shut down for the winter when I was passing through. The Wawona Hotel is the location of the last gas before Yosemite Valley. The Wawona Road crosses the South Fork Merced River on the 1937 South Fork Merced River Bridge. The Wawona Covered Bridge is located upstream to the right of this photo and apparently has been restored several times. The Wawona Covered Bridge can be accessed via Forest Drive in the Pioneer Yosemite History Center. One of the Yosemite Stage & Turnpike Company wagons is on display in the barn next to the Wawona Covered Bridge. The Wawona Covered Bridge as stated above was part of the Wawona Road until 1937. The Wawona Covered Bridge was damaged by flooding on the South Fork Merced River in 1955 but was reconstructed as a center piece of the Pioneer Yosemite History Center. The Wawona Covered Bridge is one of twelve remaining in California. The Pioneer Yosemite History Center has various other buildings from various periods of tourism within Yosemite. North of the Pioneer Yosemite History Center the Wawona Road is curvy but nothing too difficult. Most of the Wawona Road is signed as 35 MPH which I honestly think is a little on the slow side for most of the route. Most of the curves ascending up to Chinquapin are pretty generous but there are oddities like this one. Yosemite West can be accessed from the Wawona Road. Yosemite West is an oddity that is just outside of the Yosemite National Park boundary in Sierra National Forest. There are various rental homes that are used by people visiting Yosemite. The Glacier Point Road junction is located at Chinquapin which is the high point of the Wawona Road at about 6,000 feet above sea level. Yosemite has really odd looking California State Route spades and the Wawona/Glacier Point Road junction is no exception. The Wawona Road begins it's descent to Yosemite Valley north of Glacier Point Road. Grouse Creek is a couple miles north of Glacier Point Road which is where the Old Wawona Road split from the modern alignment. I inspected Grouse Creek but I couldn't find anything resembling a road grade. What I do know for certain is that the Old Wawona Road turned on the north bank of Grouse Creek. On the Yosemite History Facebook Page I was advised by Michael Mariant and Chris Falkstein that the grade of the Old Wawona Road is north of Grouse Creek and be easily spotted from a rock retaining wall. The Old Wawona Road apparently diverged slightly from the modern right-of-way the west at Henness Ridge Drive. The descent to Yosemite Valley doesn't have a ton of pullouts but wide views can be seen. There are a couple dirt patches that allow good viewing points for the Merced River Canyon. There are some nice tall views of the granite cliffs approaching Yosemite Valley. The Wawona Road makes an eastern swing towards the Wawona Tunnel and the first glimpse or Half Dome in addition to Yosemite Valley can be seen. There is a lengthy view of the Merced River Canyon opening up into Yosemite Valley. The Big Oak Flat Road can be seen below. Two of the tunnels on the 1940 Big Oak Flat Road can be seen as the road appears to be going directly through the granite rock face. The Wawona Road descends the towards the granite rock wall up ahead towards the Wawona Tunnel. Overhead clearance is listed as just over 10 feet for the Wawona Tunnel. The shape of the bore that dug the Wawona Tunnel is obvious from the shape of the structure. The Wawona Tunnel is well lit and signed with a 35 MPH speed limit. 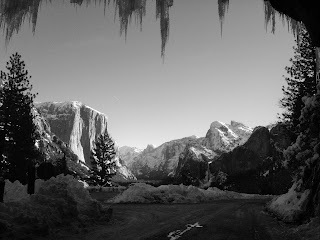 The Wawona Tunnel opens up into Yosemite Valley, Bridalveil Falls can be seen ahead to the east. 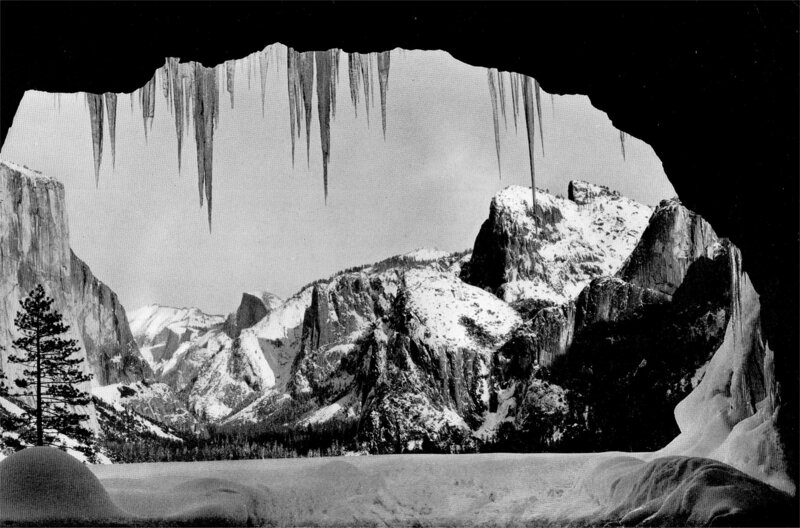 I'm fairly certain that Ansel Adam's photo of Yosemite can't be replicated from the Wawona Tunnel these days. I believe the current parking area is a somewhat new facility that was substantially different when the Wawona Tunnel opened in 1933. Last year the winter was way more severe and this was my best attempt at replicating Ansel Adams Tunnel View photo. Suffice to say R1 chain controls were in place and I thought that I was lucky I didn't encounter R2. The Tunnel View is one of the best in Yosemite National Park, so much so that I think it plays a large contributing factor as to why the Old Wawona Road has largely been forgotten. The Yosemite Valley side of the Wawona Tunnel has a much more natural appearing face. The Wawona Road actually has what appears to be mileage markers but are rather guidebook way points. The Wawona Road way points are listed as "W" with the Tunnel View being located at "W2." A connecting trail to up to the Pohono Trail starts at the Tunnel View. The Old Wawona Road is about 700 feet above the Wawona Tunnel about half way to Inspiration Point. The climb up to the Old Wawona Road isn't exactly a smooth or well marked trail. The trail is obvious enough and has a somewhat moderate difficulty. At a junction of three steel signs the Old Wawona Road grade is obvious. This picture is facing east looking down the Old Wawona Grade towards Bridalveil Falls. Looking west on the Old Wawona Road the damage to road since the 1930s is obvious. Its hard to believe that wagons and cars really used to use this road to get to Yosemite Valley. Looking west again the rock debris is a little more apparent on the Old Wawona Road grade. Its a real shame there isn't even a historical marker. The hike back down to the Tunnel View had some really worthwhile views of Yosemite Valley. Continuing east of the Tunnel View on the modern Wawona Road the Old Wawona Road grade can be observed where the "Speed Reduced to 25 MPH" sign is located approaching Bridalveil Falls. This particular part of the Old Wawona Road was so apparent that I actually found on the Google Street View. The Wawona Road ends at South Side Drive near the Bridalveil Falls parking lot. Of course making to Yosemite Valley I had to do another hike somewhere. I parked at the Mist Trailhead and made my way up to Vernal Falls. Normally the Mist Trail is closed in the winter but it has been so dry this year that it was still open and devoid of snow. Heading out of Yosemite Valley traffic was redirected onto South Side Drive. It appears there was some long overdue roundabouts installed near Yosemite Village. I snagged a view of Yosemite Falls from a distance, it felt kind of odd to see the Valley so dry after last year. I'd speculate that the dryer weather will mean less people this year but it is supposed to snow a couple times in the next two weeks. I headed back to Oakhurst to meet up my significant other for lunch and headed up to Fresno.